How likely is that? One relevant source of knowledge is the historical record of geomagnetic disturbances, which is what this post considers. In approaching the geomagnetic storm issue, I had read some alarming statements to the effect that global society is overdue for the geomagnetic "Big One." So I was surprised to find reassurance in the past. In my view, the most worrying extrapolations from the historical record do not properly represent it. I hasten to emphasize that this historical analysis is only part of the overall geomagnetic storm risk assessment. Many uncertainties should leave us uneasy, from our incomplete understanding of the sun to the historically novel reliance of today's grid operators on satellites that are themselves vulnerable to space weather. And since the scientific record stretches back only 30–150 years (depending on the indicator) and big storms happen about once a decade, the sample is too small to support sure extrapolations of extremes. Nevertheless the historical record and claims based on it are the focus in this and the next post. I'll examine four (kinds of) extrapolations that have been made from the record: from the last "Big One," the Carrington event of 1859; from the July 2012 coronal mass ejection (CME) that might have caused a storm as large if it had hit Earth; a more complex extrapolation in Kappenman (2010); and the formal statistical extrapolation of Riley (2012). I'll save the last for the next post. Perhaps the most important comparison is in the last row. 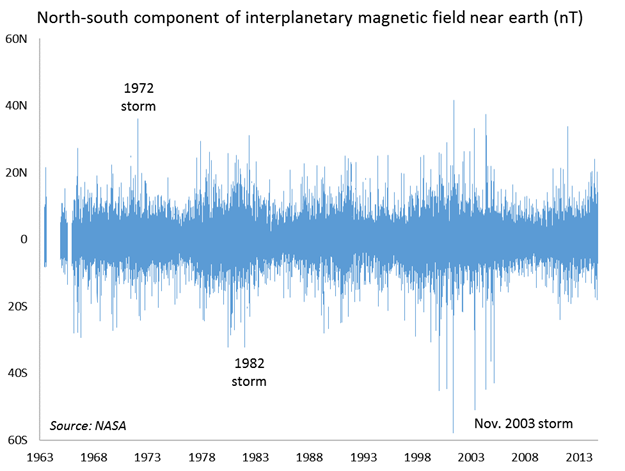 The storm-time disturbance (Dst) index measures the change in Earth's magnetic field, as measured at four low-latitude observatories; it roughly proxies the overall geomagnetic impact of a storm. The Dst has only been compiled since 1957; scientists estimate that the Carrington event would have registered at roughly –850 nanotesla. As shown in the table, the biggest value on record is –589 nT; it occurred on March 14, 1989, which is when the Québec grid collapsed for some hours and permanently lost two transformers. (Last Tuesday a pretty-big CME drove the Dst to –195, the largest reading in 10 years.) This and the other comparisons in the table suggest that the Carrington storm was, conservatively, no more than twice as strong as modern events. Another important comparator is the major CME of July 23, 2012. That CME missed Earth because it left from what was then the far side of the sun. However, the NASA probe STEREO-A was travelling along earth’s orbit about 4 months ahead of the planet, and lay in the CME’s path, while STEREO-B, trailing four months behind earth, was also positioned to observe. The twin probes produced the best measurements ever of a Carrington-class solar event (Baker et al. 2013). Since the sun rotates about its axis in less than a month, had the CME come a couple of weeks sooner or later, it would have smashed into our planet. Two numbers convey the power of the near-miss CME. First is its transit time to earth orbit: at just under 18 hours, almost exactly the same as in the Carrington event. A slower CME on July 19 appears to have cleared the interplanetary medium of solar plasma, resulting in minimal slowdown of the big CME on July 23. The second number is the strength of the component of the CME’s magnetic field running parallel to earth’s. When a CME hits Earth, it strews the most magnetic chaos if its field parallels Earth’s (meaning that both point south); then it is like slamming together two magnetized toy trains the way they don’t want to go. The southward component of the magnetic field of the great July 2012 CME peaked at 50 nT. Here, however, “south” means perpendicular to Earth’s orbital plane. Since Earth’s spin axis is tilted 23.5° and its magnetic poles deviate from the spin poles by about another 10°, the southerly magnetic force of the near-miss CME, had it hit Earth, could have been more or less than 50 nT, depending on the exact time of day and year. Baker et al. (2013, p. 590) estimate the worst case as 70 nT south, relative to earth’s magnetic orientation. In contrast, the prominent analyst John Kappenman has favored a factor of 10 to characterize the likely 100-year storm relative to the strongest recent storms. Recognizing that this contrast with my interpretation of the evidence begs explanation, I investigated the basis for the factor of 10. It appears to arise as the ratio of two numbers. One represents the worst disruption that geomagnetic storms have wrought in the modern age, meaning, again, the Québec blackout in March 1989. As Kappenman points out, just as the Richter scale doesn't tell you everything about the destructive force of an earthquake in any given spot – local geology, distance from the epicenter, and building construction quality matter too – the Dst index doesn't tell you everything about the capacity of a storm to induce electrical surges in any given place. 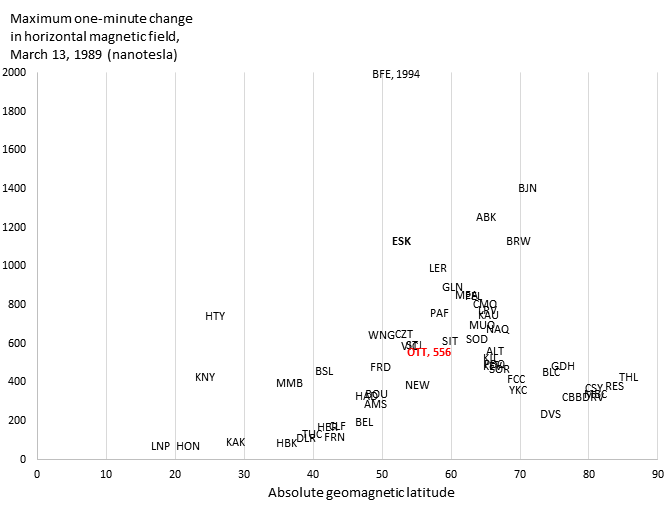 What matters is not the total perturbation in the magnetic field, globally averaged, but the rate of magnetic field change from minute to minute along power lines of concern. By the laws of electromagnetism, a changing magnetic field induces a voltage; and the faster the change, the bigger the voltage. In Québec in 1989, the rate of magnetic field change peaked at 479 nT/min (nanotesla per minute) according to Kappenman. Ottawa (OTT, in red) recorded a peak change of 556 nT/min, between 9:50 and 9:51pm universal time, which is compatible with Kappenman's 479 for nearby Québec. Brorfelde recorded the highest value, 1994 nT/min. The other number in Kappenman's factor-of-10 ratio represents the highest estimate we have of any per-minute magnetic field change before World War II, at least at a latitude low enough to concern Europe or North America. It comes from Karlstad, in southern Sweden, during the storm of May 13–15, 1921. The rate of change of the magnetic field was not measured there, but the electric field induced in a telegraph line was reportedly estimated at 20 volts/kilometer (V/km). Calibrating to modern observations, Kappenman calculates, “the 20 V/km observation…suggests the possibility that the disturbance intensity approached a level of 5000 nT/min.” Elsewhere Kappenman suggests 4800 nT/min. And 4800/479 is just about 10. That is, the worst case on record looks to be 10 times as bad as what caused the Québec blackout. While there is apparently no evidence that fluctuations as great as 4800 nT/min have happened over large areas, Kappenman's simulated 100-year storm scenario assumes that extremes of this order would occur across the US in a 5-degree band centered on 50° N geomagnetic latitude (an area 350 miles wide north-south, 3,000 long east-west) – 4800 nT/min east of the Mississippi and 2400 nT/min to the west. The associated estimate that a 100-year storm would put 365 high-voltage transformers at risk of permanent damage, out of some 2,146 in service, affect regions home to 130 million people, and reduce economic output by trillions of dollars, entered an oft-cited National Research Council conference report. Yet to me, this seems like a highly unrepresentative extrapolation from history. I found one other independent review of the Kappenman analysis. It was commissioned in 2011 by the US Department of Homeland Security from JASON, a group of scientists that advises the government on issues at the intersection of science and security. The JASON report concludes: "Because mitigation has not been widely applied to the U.S. electric grid, severe damage is a possibility, but a rigorous risk assessment has not been done. We are not convinced that the worst-case scenario of [Kappenman] is plausible. Nor is the analysis it is based on, using proprietary algorithms, suitable for deciding national policy....[W]e are unlikely to experience geomagnetic storms an order-of-magnitude more intense than those observed to date." Despite some spectacular reports from 1859 Carrington event and some equally spectacular scenario forecasts, to this point in our inquiry, the historical record appears surprisingly reassuring. There is little suggestion that the Carrington event – or any other in the last two centuries – was more than twice as strong as the biggest storms of recent decades, in 1982, 1989, and 2003. And civilization shrugged those off, with only a few high-voltage transformers taken out of commission. This does not prove geomagnetic storms pose no global catastrophic risk; like the JASON group, I don't feel we can rule that out. But it does lead us to more focussed questions: What are the risks posed by a doubling of storm strength relative to recent experience? Under what assumptions would the effects be extremely disproportionate to the increase in magnetic disruption? What steps could be taken to change that? In fact, I don't feel that I have satisfactory answers to those questions. The area appears under-researched, and that may point to an opportunity for philanthropy. But I get ahead of myself. In the next post, I will make a final approach on the historical record, this one more systematic and statistical. I think it's important but it will not change the conclusion much. Downloaded from cdaweb.sci.gsfc.nasa.gov/cdaweb/sp_phys, data set OMNI2_H0_MRG1HR, variable "1AU IP Bz (nT), GSM” (meaning 1 astronomical unit from sun, interplanetary magnetic field Z component, nanotesla, geocentric solar magnetospheric coordinates). Readings are hourly, with gaps. “Because the [1-in-100 year scenario] 4800nT/min threat environment is ~10 times larger than the peak March 1989 storm environment, this comparison also indicates that resulting GIC peaks will also in general be nearly 10 times larger as well” (Kappenman 2010, p. 4-12). “This disturbance level is nearly 10 times larger than the levels that precipitated the North American power system impacts of 13 March 1989” (Kappenman 2004). "Measured data has shown that storms with impulsive disturbance levels that are 4 to 10 times larger than those that impacted the North American grid in March 1989 have occurred before" (Kappenman 2012, p. 2). Plotted are all stations with data for the period in NOAA’s SPIDR system or the Nordic IMAGE network. Geomagnetic latitudes are from NASA's geomagnetic coordinate calculator. A list and maps of observatories is here. Very instructive article, especially for me, an FIU professor working on a new theory of GIC in which the maximum theoretical field is about 16 V/km. So I was delighted to see that the 20 V/km was a historical fiasco, reduced down to 10 V/km. When is the next blog on this matter?